Housing styles of Istanbul are a fascinating insight, not only into Turkey’s largest city but how architectural trends and external influences can affect an urban landscape. Long-time visitors and residents have seen massive changes over the last decade as Turkey modernises its real estate market, but changes happened long before now. Sibel Bozdog said the residential architecture and urban landscape of Istanbul changed during the 1950s and 1960s when mass migration from rural Anatolian areas forced the population count past 1 million and sparked a mid-rise apartment block trend. Such was the demand for homes, shanty towns (gecekondu) appeared on the outskirts, and for those with cash to splash, gated communities became home to upper-class members of society. The 1950s to 1980s was a defining moment changing how locals lived, but more exciting styles that will interest tourists pre-date that era and stem from Ottoman times. From the 16th century, skilled craftsmen-built houses using wood. Most were two or three levels with a ground floor storage area. Toilets were outside, and an upstairs multi-purpose room was where residents ate and slept. Some historians say using one large space for many purposes originated from nomadic Turkish tribes, whose cultural influence also appears in old and 100% authentic Turkish carpets. However, wood is a massive fire risk, so after World War One, officials banned its use for house construction. 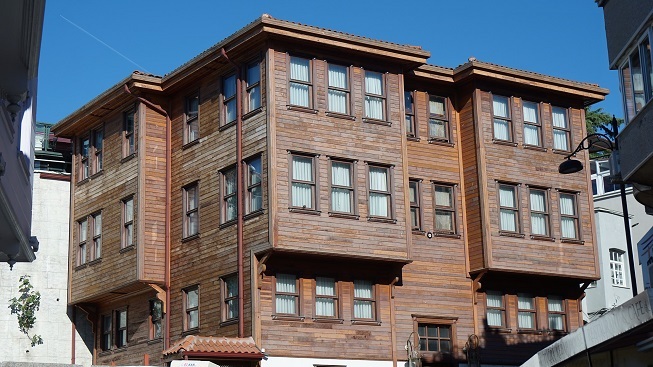 This made wooden houses in Istanbul a rarity. Pre-19th century neglected houses eventually became unsafe to live in and were torn down, leaving just a few intact examples. UNESCO took notice and in 1985 said they were a global cultural inheritance, so they focused their attention on Zeyrek and Suleymaniye neighbourhoods in the Fatih district. Built with oak and pine, core features of these adjoining properties were Exedras, a semi-circle seating area on the front facade. Over 5 years, from 1999 to 2004, UNESCO with official Turkish organisations sought to restore them, and in 2006, Turkey set up KUDEB, an organisation specialising in traditional building techniques who said they restored 55 homes to their former glory. Yet in 2010, World Bulletin published a report saying houses in Suleymaniye were under threat. 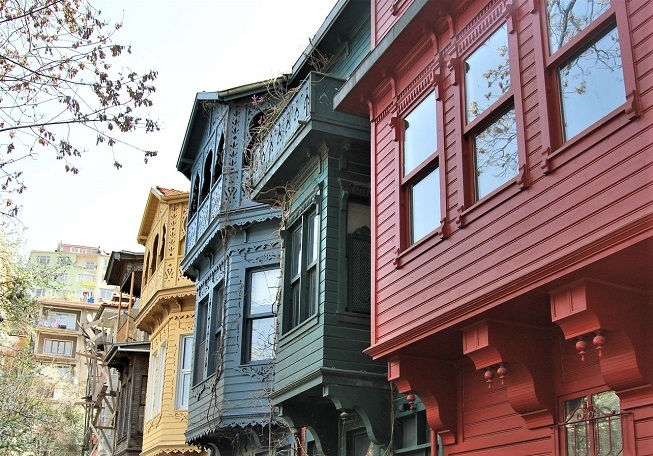 Martin Bachman from Germany’s Archaeological Institute said only 250 wood houses remained despite them being Istanbul’s most prominent housing style throughout the Ottoman era. 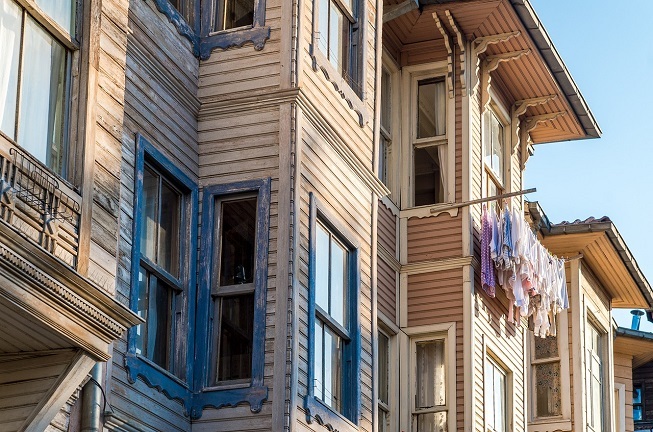 Near the Sultanahmet district, Sogukcesem street often lures in curious tourists eager to see old 4 to 10-bedroom homes restored by Turkish preservationist Celik Gulersoy. Three are now open as the Ayasofya Pansiyonlari hotel. In 2003, the European Union granted 7 million euros into preserving homes in the Balat and Fener districts, but in later stages, they included Zeyrek and Suleymaniye neighbourhoods. Balat and Fener feature three-story stone buildings, and they also included exedras. Visitors who want to see neighbourhoods away from touristic districts often sign up for walking tours around streets of the former Greek Orthodox and old Jewish quarters, which appear in travel magazines. 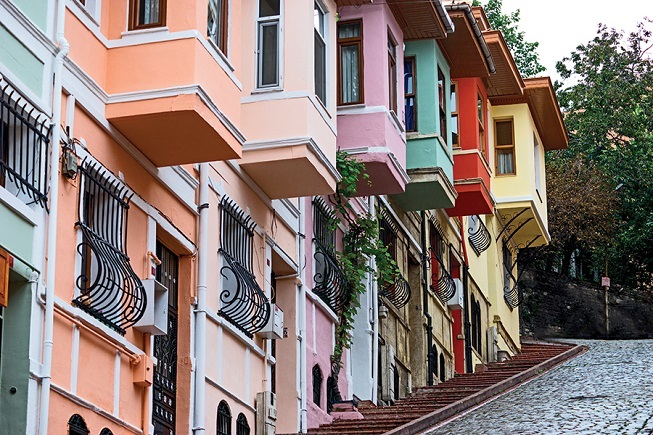 Another popular spot to see colourful, Ottoman houses is the Kuzguncuk neighbourhood on the Asian side. These houses have appeared in many Turkish soap operas. Built and owned by elite members of Ottoman society, you can see wooden yali mansions lining the Bosphorus shoreline by taking a short ferry ride. As well as being elaborate and upmarket, these shoreline villas had a woman’s and man’s section for personal hosting of guests. Their historical value has led them to become Turkey’s most expensive real estate. Read more about Bosphorus mansions of Istanbul. Skyscraper living, the latest trend in Istanbul, especially on the European side, features communal facilities like indoor/outdoor swimming pools, gyms, landscaped gardens and 24-hour security. 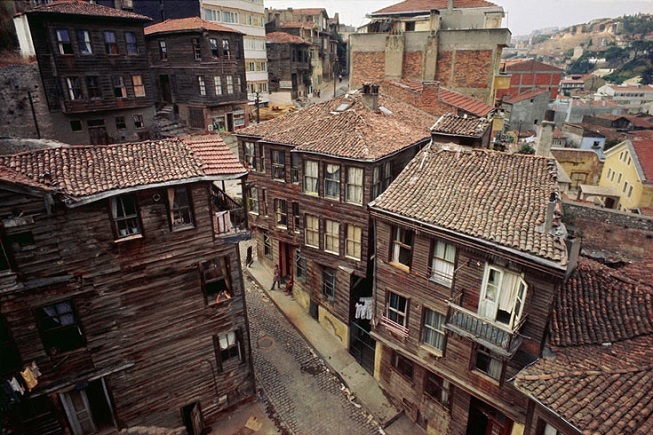 Tip: To see photos of old housing styles in Istanbul, Ara Guler’s work is mesmerising. Nicknamed the eye of Istanbul, he photographed the city over 70 decades until his death in 2018. Some of his work is now on display in the Sisli Ara Guler Museum.